I can eat oatmeal chocolate chip cookies at any time of the year, but for me, fall feels like the perfect time. The cinnamon adds a hint of spice and the old fashioned oats add the appropriate layer for the colder season. I am starting to feel the change of the season from fall to winter. My children are talking incessantly about Christmas but I’m not quite ready to say adieu to fall. While baking I feel grounded in the present. It helps me experience each season to the fullest. While I worked as the head baker at the Green Bean, I found that planning and testing recipes for the next season was one of my favorite parts of the job. This is why I love this space. It makes me feel fully alive. I love this recipe! This is the first time that I have made cookies with brown butter and I assure you that it won’t be the last. I hope you enjoy it as much as we did. I adapted the Oatmeal Pecan recipe on the back of the Kroger old fashioned oats container for this recipe. I used a few of the techniques from the Serious Eats chocolate chip cookie recipe. If you want to understand the science behind cookies then check it out. Besides browning the butter, we also incorporate the sugar differently in this recipe. Lastly, make sure to give the dough a rest over night. Resting the dough allows the cookies to have additional flavor when the cookie is baked. Melt butter in a small pan on the stove on medium heat. Once melted, the butter will start to bubble and turn a little more golden. Stir butter and watch for brown bits on the bottom of the pan. The butter is beginning to brown. Continue to stir and allow the butter to continue to brown for another 30 seconds or so. We don’t want our butter to scorch though so I tend to err on the side of caution. The butter in the above picture is lightly browned and could’ve gone a little longer. Pour the butter into a small bowl and add an ice cube. This not only cools the butter down more quickly but it also adds back the liquid that was lost during the browning process. Put the bowl in the fridge and let cool for about 30 minutes. Don’t rush this part. Hot butter will curdle the eggs. Whisk the flour, salt, cinnamon and baking powder in a medium bowl and set aside. Grab another small bowl and add the oats and chocolate chips and set aside, as well. Using the whisk attachment, whisk the eggs and granulated sugar in the bowl of the mixer. Whisk on medium for about 5 minutes. The mixture will be light in color and will fall in ribbons from the whisk. 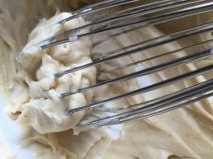 Remove the whisk and use the paddle attachment for the rest of the batter. Add in cooled butter, vanilla and brown sugar. Mix on medium until combined, about 30 seconds. With the mixer on low, add in your flour mixture. Mix until there are a few streaks left in the batter. Lastly, add in the oats and chocolate chips. Mix on low or use a wooden spoon until incorporated. Nice job! Place batter along the length of a large piece of parchment paper and roll it up and twist the ends like a piece of taffy. Alternately, you could place batter in a bowl and cover. Place batter in fridge to rest. Pull the dough out of the fridge and let it warm up. 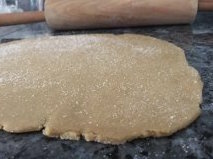 The cookies will spread easier with a dough that is closer to room temperature. Preheat the oven to 325º and line a baking sheet with parchment paper. For smaller cookies, scoop cookies into 1 1/2 inch balls (about the size of a chestnut). For larger, big as your hand, cookies use a 1/4 cup scoop. Roll into balls and slightly flatten on the baking sheet. Bake until the edges are golden and stay firm when slightly touched. The center should be lighter in color from the edges but not look wet. Start checking for doneness around 10 minutes for smaller cookies. It might take 15 until they are done. Once baked, let cool on the tray for a couple minutes and then move to a cooling rack. Success! I feel the end of summer creeping up behind me and the panic arises within: have I lived summer to its fullest? Did we squeeze the last drop of sunshine out of each and every day? Probably not, but we have had tons of fun and that qualifies as success in my book. Yet I realize that we haven’t made any cookies! Sure, we have bought ice cream sandwiches from the corner store and made chocolate banana bread, but no cookies. It’s time to rectify that oversight pronto. I spent many afternoons mixing together chocolate chip or peanut butter cookies on my summers off from school, ready to be devoured right out of the oven. 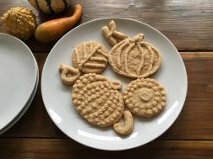 Peanut butter cookies with their simple cross hatch and light crunch of sugar, make it one of my favorites. 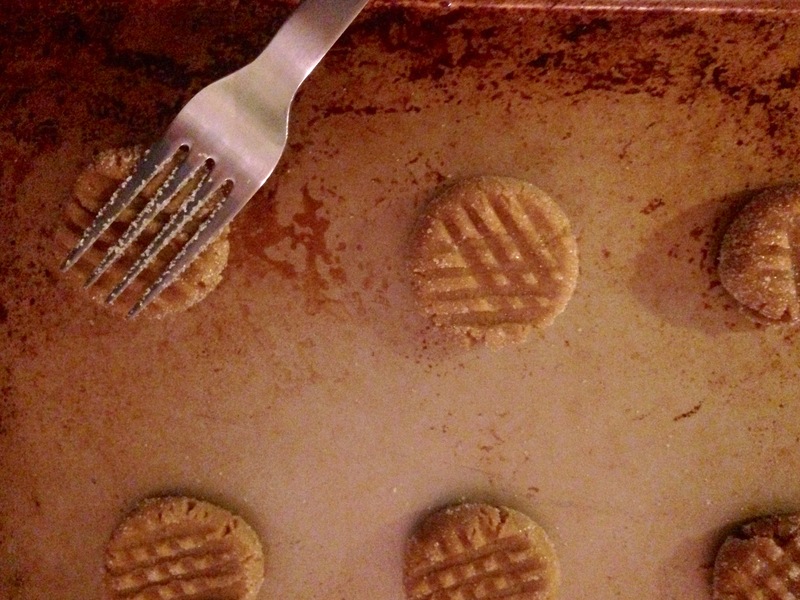 My dad remembers my grandma making peanut butter cookies when he was a child as well. I wanted to try a version with our pantry staple peanut butter, Adams. Adams brand doesn’t include any added sugar and this can be a problem with some recipes. I used the Adams Creamy No Stir peanut butter in this recipe. The cookie turned out exactly like I wanted, crisp outside and slightly chewy. The addition of almond extract adds a nice depth of flavor. This recipe is mildly adapted from L.V. 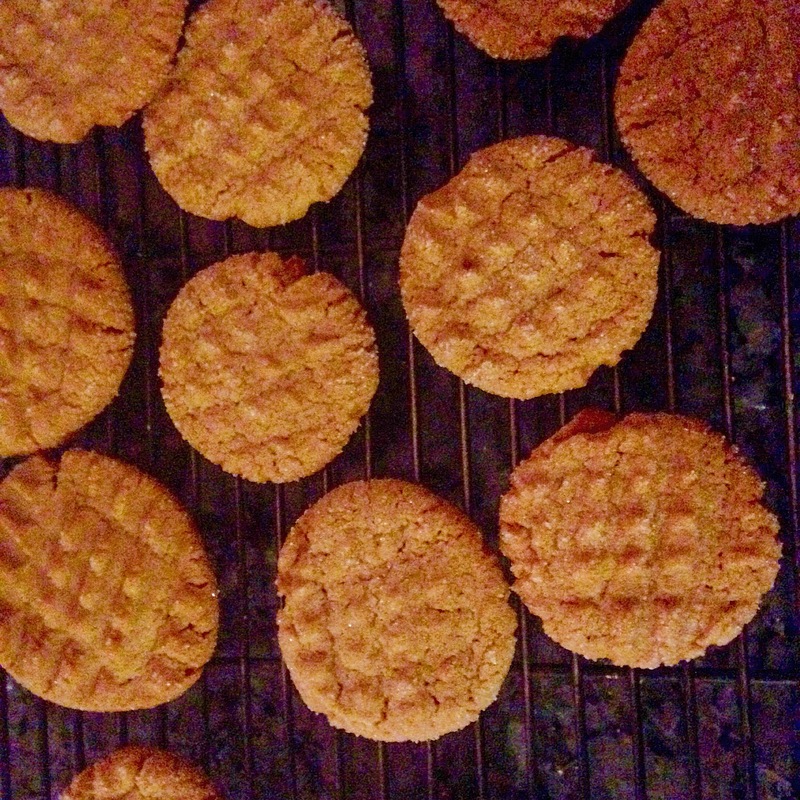 Anderson’s Peanut Butter Cookies. I used a bit less almond extract and some extra sugar for rolling, but kept it pretty much the same. In a medium bowl, mix the flour, baking soda, and salt and set aside. In the bowl of a stand mixer, cream the peanut butter, brown sugar, and butter until light and fluffy (3-4 minutes on medium low). Turn the speed to low and add in egg, vanilla, and almond extract. Scrape as needed. Mix for 1 minute. Turn the mixer to “stir” and add the flour mixture. Combine until just mixed. Scrape batter out on parchment paper and shape into a log. 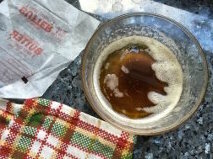 Roll up and twist the ends (like a tootsie roll) and place in the refrigerator for at least three hours. I put mine in over night. Once ready to bake, preheat the oven to 350 degrees Fahrenheit. Roll dough into 1 inch balls and then roll into granulated sugar to coat. Place 2 inches apart on ungreased baking sheet. Slightly press each ball with a fork in a cross hatch design. Bake for 10 minutes until slightly browned on the edges. Cool on wire rack and enjoy! Store in an air tight container.